I would like to thank all the blogger friends for sending in their creations to my first event and for making this event a successful one. Though I never expected such a response I must say that I am floored by all the lovely recipes sent to me. 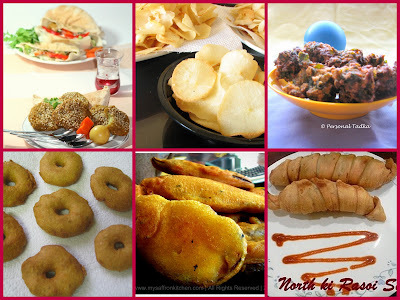 Such artistic photography on display only increase your hunger pangs and makes you crave for more. So come along and let me take you on the deep fried snacks trail. Rupali for Recipe Grab bag has sent in Tikhat Mitha chya Poorya, a Maharashtrian snack. Sayantani of A Home Maker’s Diary has passed some delicious Bengali fried Pastry (Jibe gaja) which I would to have at any time of the day. Can a snack be made of Betel leaf? Yes says Revathi Madan of Kaarasaaram with her Betel leaf Vadai which is something new to me. 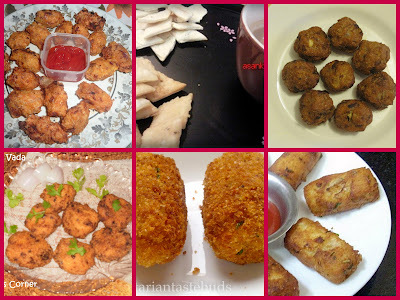 Raji of Vegetarian tastebuds has sent Sago Cutlets Boy they do look like Nuggets though. 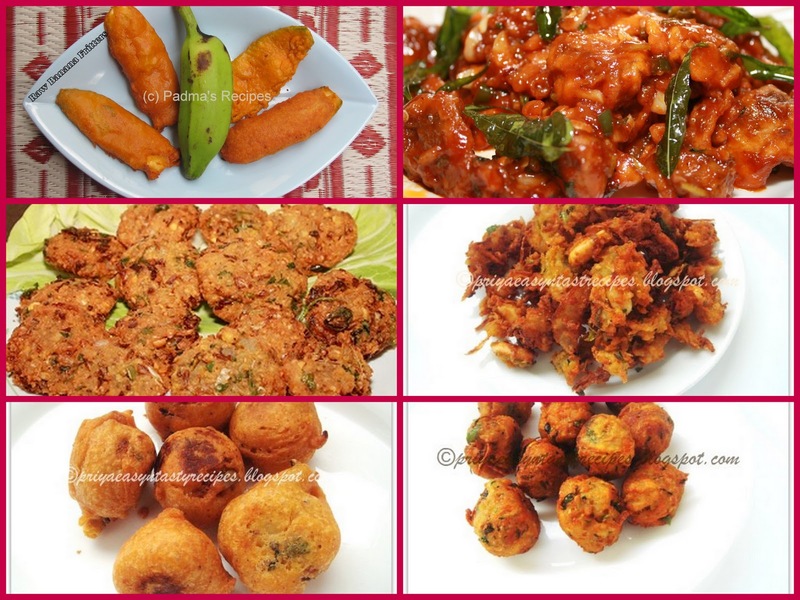 Viki of Viki’s Kitchen has sent some amazing Thengai paal murukku, masaal vadai, vazhai kaai bajji my way. 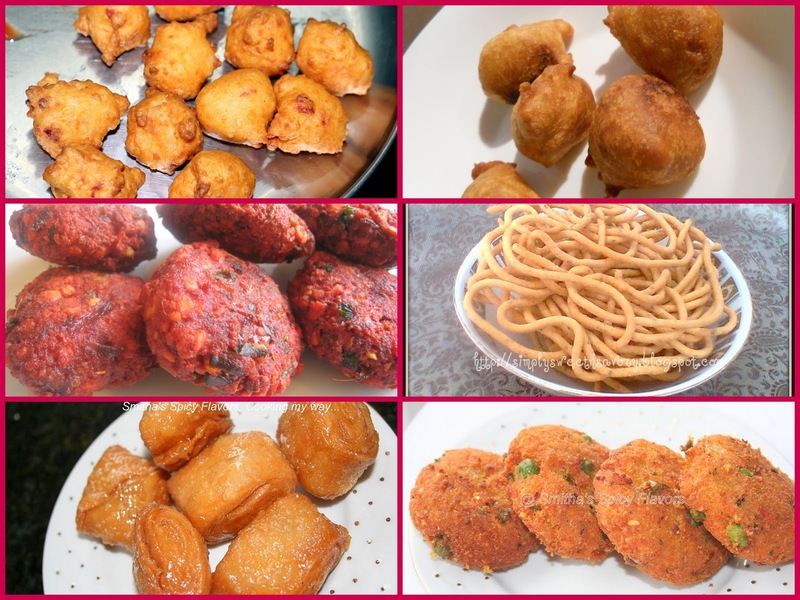 Check out this perfect looking Batata Vada sent in by Swathi of Zesty South Indian Kitchen. 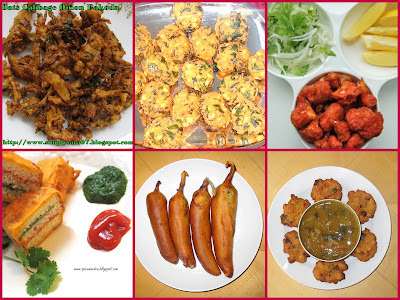 Keerthana of Life n Spice has sent Cabbage Pakoras a perfect tasty snack I am sure. Do check this Falafel sent by Judith Serrao of Bring On The Chef In You. Wishing for some chips, check out Tapioca Chips sent by Sarah of Spoonful Of Delight. Kanchan of Kitchen Gossip has sent Radish Leaves Fritters which I am sure is very healthy and kids will gobble up without a murmur. 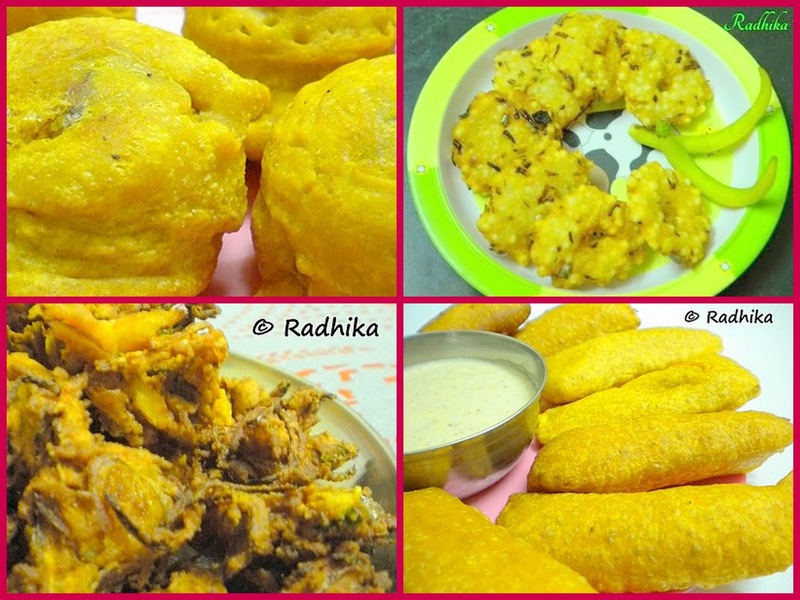 This is my all time favorite Banana blossom vadai sent by Krithika of Krithi’s Kitchen. 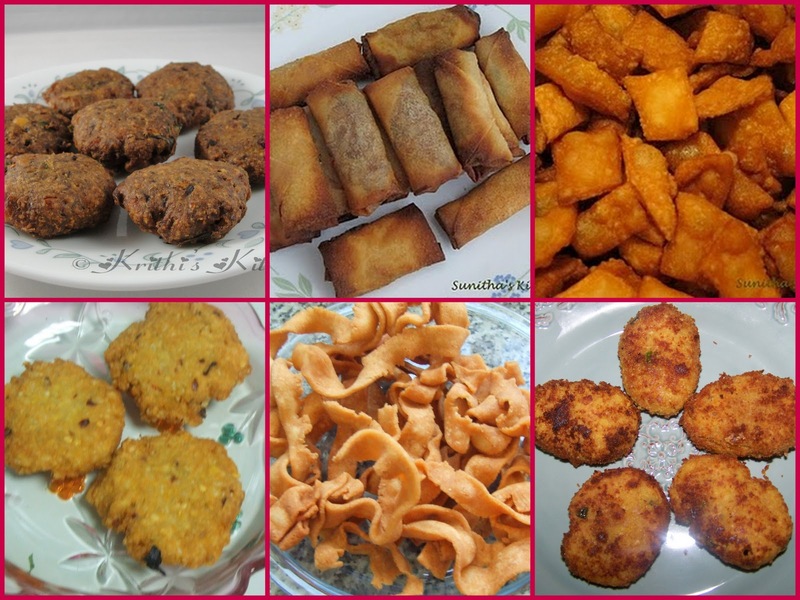 SunithaJaga has sent two lovely looking entries Spring Roll and some crispy Maida Buiscuits. Check out this Mirchi Bajji sent in by Satya of My Innovative Kitchen. Do check out this Gobi 65 sent in by Veena of Veg junction. Nivedita of Nivedita’s Kitchen has sent in yummy looking Dill leaves Vada. Mythreyi of Yum! Yum! Yum! has sent Palakura Garelu which is definitely yummmy indeed. 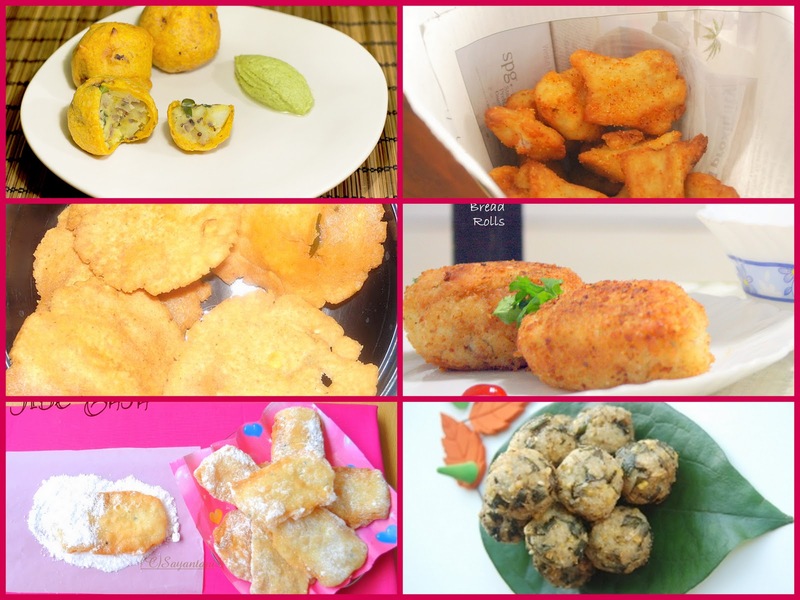 Wishing for Bhajjis this should satisfy your hunger pangs Raw Banana Fritters sent in by Padma of Padma’s Recipes. Rachana of Sizzle N Spice has sent in this delicious Tortilla Samosas . Sangeetha of Sangi’s Food world has sent these yummy looking Cabbage kofta . Don’t forget to check this out. 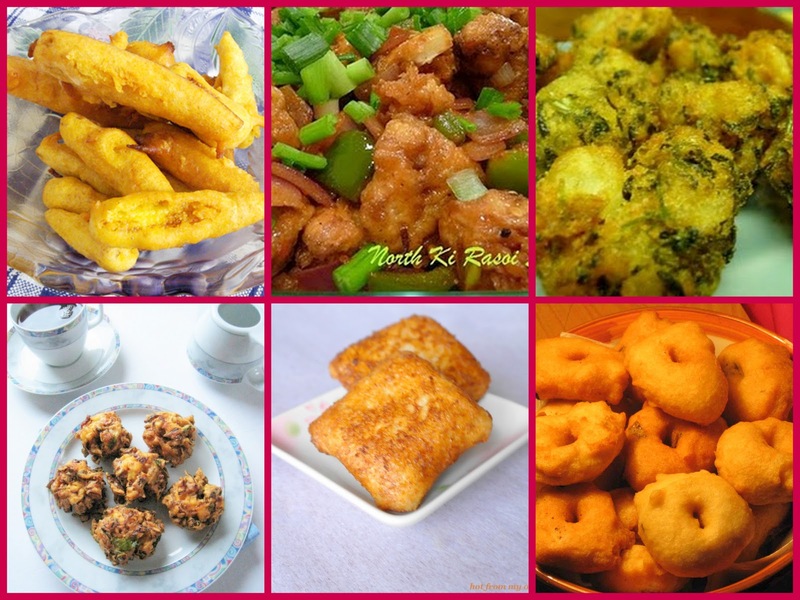 Looking for some yummy looking Gobi Manchurian sent by Krithi of Krithi’s Kitchen. Vatsala of Show and Tell has Eggless Fried Icecreame very different indeed. Jayasri has sent in these leeks and Mushroom Fritters . 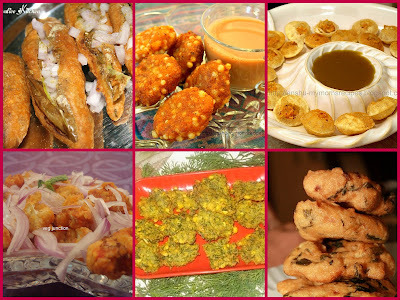 Nashira Usef of Plateful has sent in this all time favorite Mirch pakora – Mulaku bajji. Saraswathi Iyer of Sara’s Corner has sent in healthy and crispy looking Oats Cabbage Onion Pakoda. 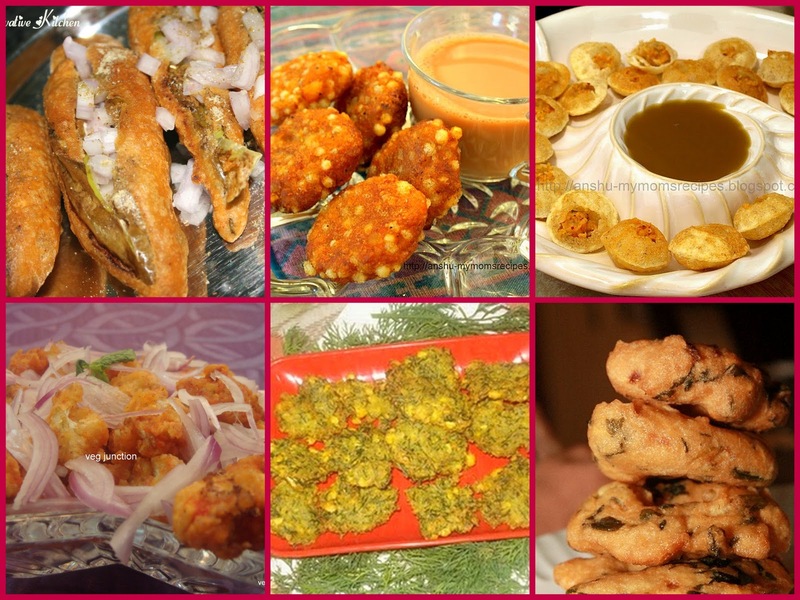 This delicious looking Dal Palak Vada sent in by Marri Hephzibah. 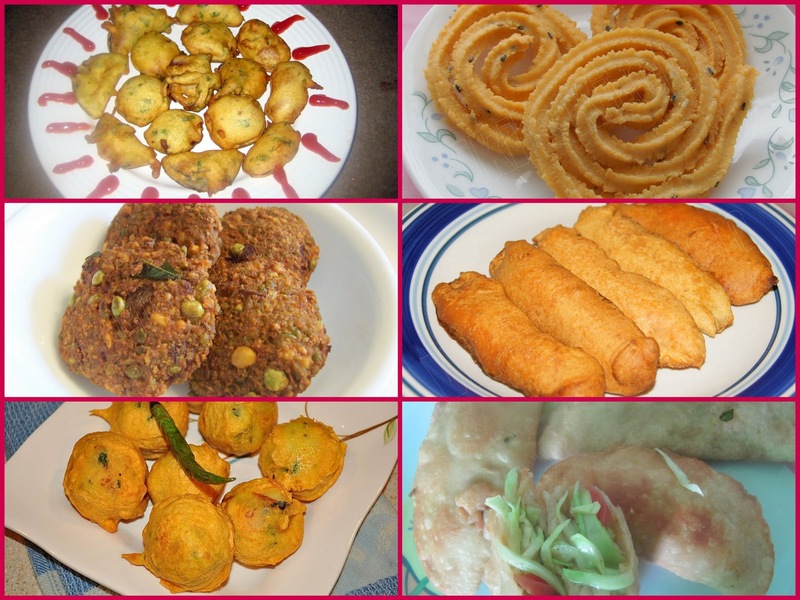 Sayali has sent in this Tirangi Vada which is quite awesome. 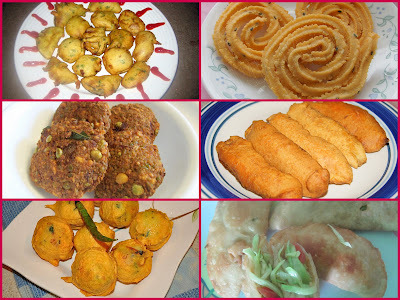 Check out this Mirchi Bhaji and Channa Dal Vada sent in by Ilavarasi of cookery point. I have tried not to miss a single entry during the compilation and if any of your entry seems to be missing in this round up pardon me and understand that it was not intentional. Please inform me and I will include that entry. Once again I thank all my foodie friends for participating in this event and for making it a success. Do not stop with this visual treat but try out the recipes when time permits and blog about it. Wait for another announcement of event in a day or two until then Happy Blogging !!!!! Lovely roundup.They all look very tempting. Really nice roun up dear and glad to follow u.
WOw,so many recipes,too bad I dint send any 🙁 Anyway great job Radhika! 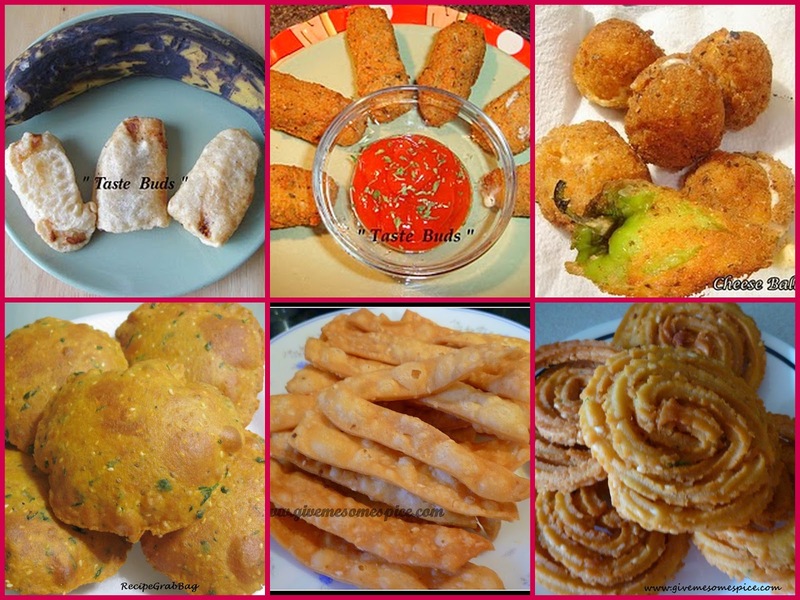 Wow so many delicious and tempting recipes..
Ohh i missed to send mine:( great round up Radhika. Nice roundup and yummy dishes. What an exceptional round-up:)!!! 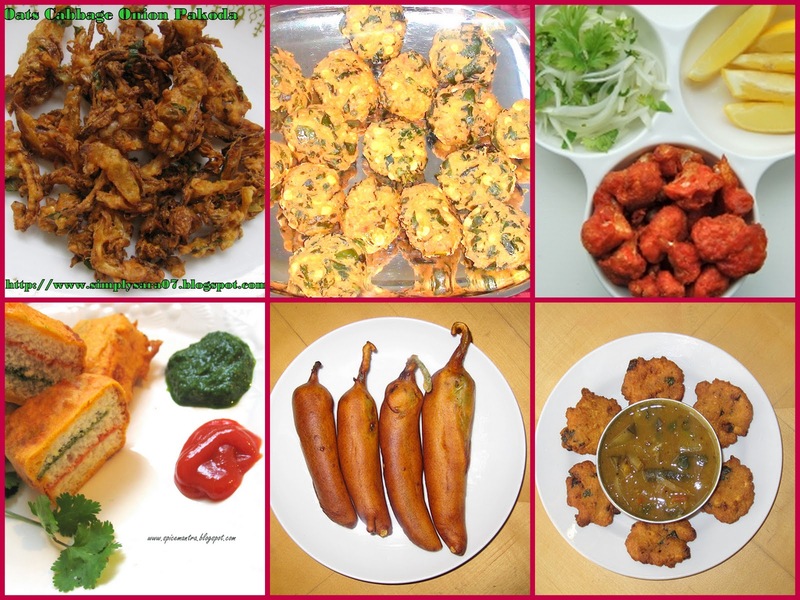 The display of all these tongue tickling dishes is enough to make everyone drool:)Well done,Radhika!!! 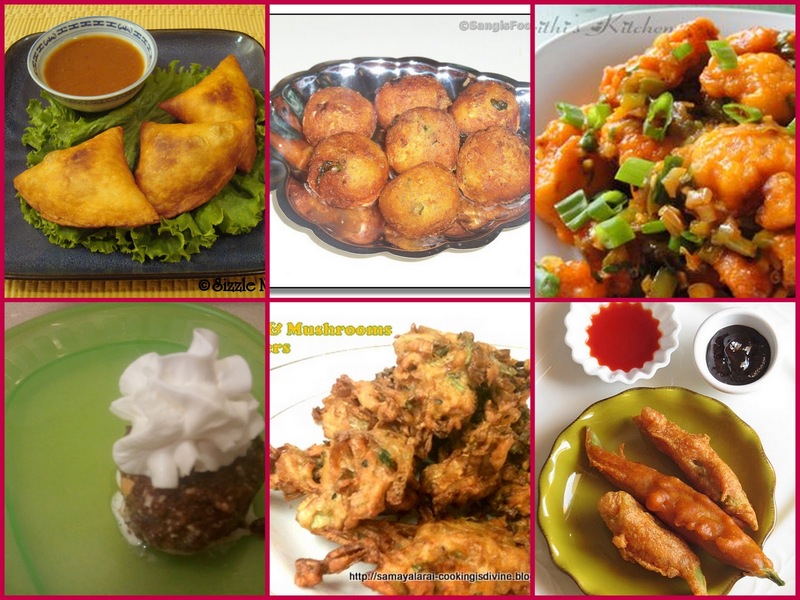 Hey Radhika, thanks so much for hosting this event and sharing our recipes! Great job!! Wow Wow and another Wow! Great round up on deep fried snacks! Thanks a lot cant wait to try each one of them!